Slaughter only 20% of the herd to provide shoes for 80%. Some don't walk outdoors much. Others manage to share. 99% of them would have been perfectly happy (and alive)! Often, the most obvious solution is wrong. 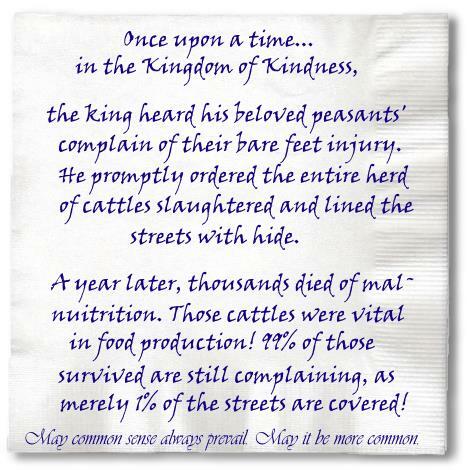 The supposed act of "kindness" turned out to be the ultimate cruelty. A true, kind king will never betray his subjects by acting hastily, or let his own place in history come before their well-being. Nor will he start frivolous, misguided crusades, at great costs to his countrymen and humanity. An evil king will jump at the opportunity to award beefy slaughtering contracts and cow hide paving projects to his cronies. May common sense always prevail. May it be more common. Written for the launch of Cameralot on September 11, 2002. "The Second Gulf War" was looming on the horizon.